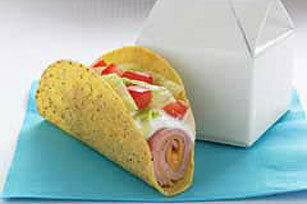 Did it ever occur to you that your taco shell could be yearning for something different? Here, a shell stands in for bread in a rolled ham sandwich. Stack ham slices; top with Singles. Roll up, starting at one short end; place in taco shell. Serve with baby carrots and fresh fruit. Wrap tightly in plastic wrap to keep fillings in place, then place in airtight plastic container to prevent taco shell from breaking during transportation. Substitute OSCAR MAYER Deli Fresh Smoked Turkey Breast for the ham.